Thanks Lou - set it up first time. This isn't working on my Kindle Fire (not HD). It says "error parsing the package". (09 Apr 2013 12:23 AM)bjkindle Wrote: Wrote: This isn't working on my Kindle Fire (not HD). It says "error parsing the package". Are you using a 1st Gen Kindle Fire - it should work ok on 2nd gen and Fire HD. If you do have a 2nd gen, try downloading the APK to your computer and transferring via USB. 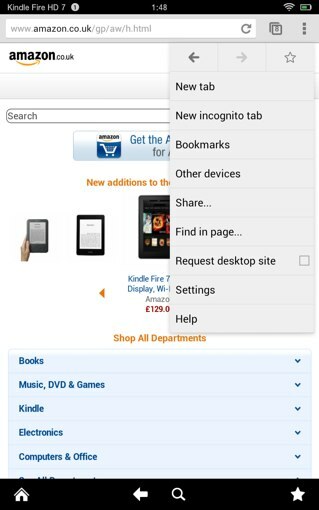 Unfortunately on the Kindle Fire, you can't change which browser is the default, so using the Web option at the top will always revert to Silk. Hi Lou. Thank you very much for your swift reply. It's nice to have an alternative browser. Hi the link is not working for me?